Re-naming a restaurant is always a good idea. You let the community know that you are no longer the restaurant you were prior to this name change. You are new and revived and come on in. Name changes don’t happen too often in Naples restaurants unless if the restaurant is under new ownership and they fully change their entire menu. This is so not the case in Blairsville. Restaurants change their name but don’t change any other aspect of the restaurant. Menu stays the same, staff stays the same, décor stays the same. The only thing that may change is the sign out front. But, don’t push it. There is one of these name changing restaurants that we always visit while in Blairsville. Currently, the restaurant is called Antoinette’s but, I have been there when it was Monet’s along with a slew of other Italian first names. We have the same waitress every time we visit no matter what the restaurant’s name is. Antoinette’s serves up Italian fare along with a wide assortment of pizzas/calzones. I’ve had the pizza in the past and its great – thin crust, plenty of toppings, overall great flavor. On this visit, it was somewhat early in the evening and I just wasn’t feeling pizza. I opted for the Ziti Pasta in Marinara Sauce and opted out of any meat options. I do not like meat and pasta together one tiny bit. My meal also included a garden salad. I normally never order pasta when I go out. It is beyond a doubt, the most overpriced item on the menu. I can purchase a pound of pasta for under $1. Why in goodness sakes would I want to purchase your pasta dish for $10-plus dollars?? Anyway, I ordered pasta here and that was that. I first received my garden salad with honey mustard dressing. This was a great salad and a good size for a side salad. The greens included a mixture of romaine lettuce, spinach and a variety of other semi-fancy lettuce leaves. The mixture was crispy and paired well with the salad toppings. All of the toppings were fresh and the dressing was good as well. The honey mustard flavor was prevalent but not overbearing. This was a great start to my meal and could have only been better had it included a piece of bread. Overall rating 7/10. My pasta was served with a large amount of marinara sauce both on the bottom of the bowl and on top of the pasta. There was just way, way, way too much sauce. I stirred the pasta around with the sauce and pushed away a good majority of the sauce. I added some parm cheese and began to eat. The pasta was a little bit overcooked for my liking but was still good. This was certainly not homemade pasta but, it still had a good overall flavor. There was plenty of pasta and I did not feel jipped by the portion size. The sauce had flavors of basil & garlic and was somewhat sweet. The main flavor was certainly garlic and I could taste it hours after I finished my pasta. If the garlic was toned down just a little bit, it would have been a really good sauce. 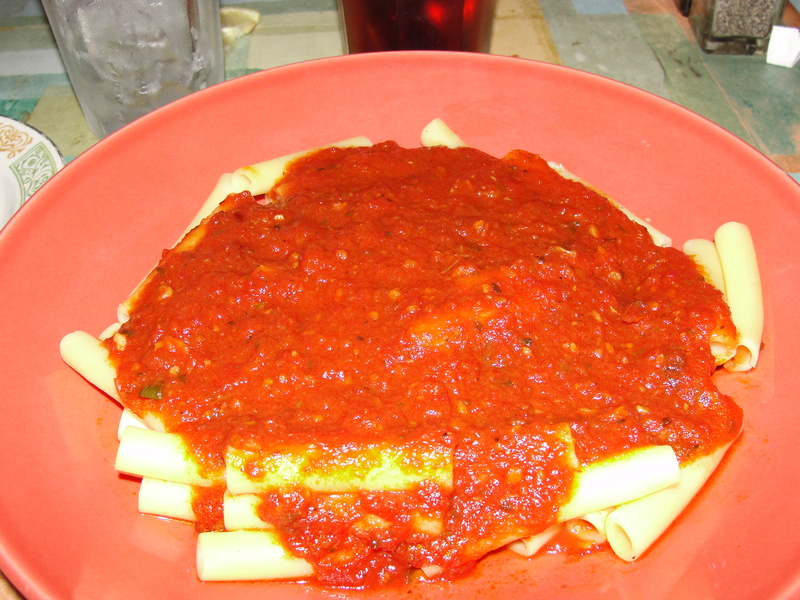 Nonetheless, the sauce was decent and was a nice accompaniment to the ziti pasta. Overall rating 7/10. Antoinette’s may change its name 6 more times before I next visit but, hopefully there food will stay the same. 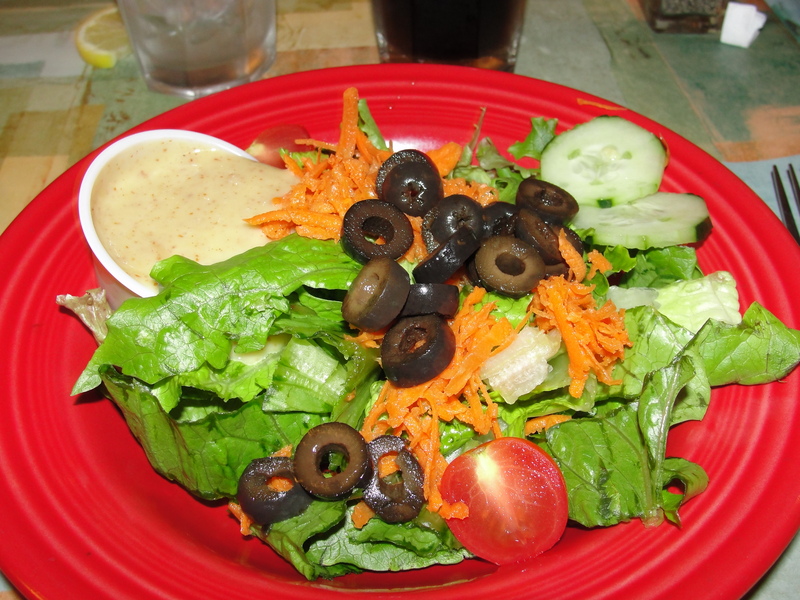 Good portion size, fresh food, plenty of options…an overall good choice for dinner in Blairsville. I have really never had a bad meal there. And, oh my gosh, they had some of the best unsweet iced tea that I have had in a long while. I had 10 glasses worth we were eating. Even if the food sucked, I would go again for the iced tea. Yeah, it was that good. ← Cereal Treats? Really? Can’t We Just Call Them Rice Krispie Treats?